It has been proposed that a proportion of non-palpable breast cancers that are diagnosed through mammography represents a very low-risk subgroup of cancers that may not affect survival (overdiagnosis). The salient pathologic features of cancers in this theoretical subgroup are not known, and therefore, it is not possible to predict which patients have a cancer of this type. 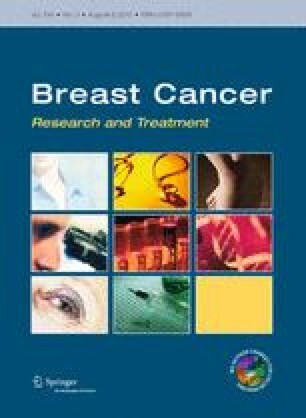 We reviewed the clinical characteristics and survival experiences of 715 patients with an invasive breast cancer of 5.0 cm or less. The tumour from each patient was represented in triplicate on a tissue microarray. Cases were divided into low-risk and moderate-/high-risk categories based on lymph node status and palpability. Low-risk cancers were those that were non-palpable, node-negative and were only detected by mammographic screening. All other cancers were high/moderate risk. The two groups of cancer patients were compared for a number of tumour characteristics, based on immunohistochemistry. There were 79 low-risk cancers and 636 moderate-/high-risk cancers. The low-risk cancers were characterized by ER-positivity, PR-positivity, HER2-negativity, ck5/6-negativity, EGFR-negativity and p53-negativity. About 54 of the 79 low-risk cancers (68 %) were of the luminal A subtype versus 335 of 636 moderate-/high-risk cancers (53 %; p = 0.008). Among 42 women with a non-palpable, mammogram-detected PR+ HER2– cancer of 5.0 cm or less, the 15-year distant recurrence-free survival rate was 100 %. Small breast cancers that are PR+ and HER2– and that are detectable by mammogram alone have a very low risk of recurrence. A proportion of these may represent examples of overdiagnosis. We thank the Canadian Breast Cancer Foundation (Ontario Chapter) for support of the Henrietta Banting database. We thank Ellen Rawlinson for maintaining the Banting database.